Below you will find ten tips on how to help your students be most successful in fourth grade. 1. Read every night with your child and ask comprehension questions that require more thought than "who is the main character?" Reading comprehension is a critical skill that will impact all subject areas. 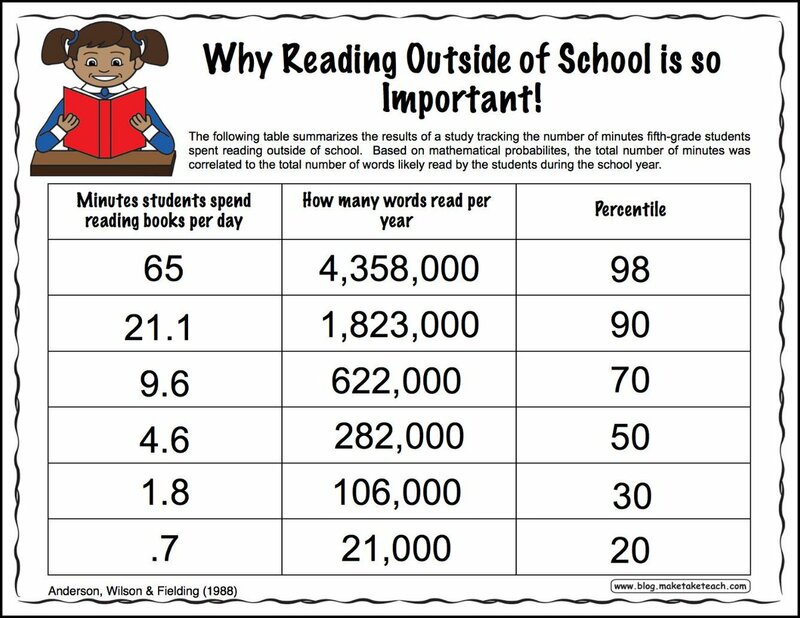 See the graphic to the right for the importance of reading every night. 2. Practice math facts (through flashcards or a website) every night. Students should have mastery of addition/subtraction by fourth grade, and need to develop mastery of multiplication/division by Christmas. All skills in fourth grade depend on students being proficient in all math facts. 3. Attend as many Home-School Connection Nights as possible. These are evening workshops I offer for families which will help you to best aid your child at home. If you cannot attend, you can always check out the broadcast on my YouTube channel. 4. View the "Two Minute Tips" on this website for extra support. These are quick videos that model math concepts. 5. Make school and schoolwork a priority. I am very aware of students being involved in sports and other extracurriculars, but school needs to be a priority in students' lives. Check the calendar and agenda for a listing of important due dates and upcoming events. Make sure they have a designated time and dedicated space to complete work at home. This space should be free of distractions and have all applicable materials. I enjoy TV and video games as much as many of the students, but make sure they don't overdo it. That being said, building games like Minecraft and Breakout EDU Digital have wonderful potential for critical thinking! 6. Review study guides frequently. Keep them in the car, at the table, and anywhere else for on-the-go review. This goes for current study guides and old ones. Just because we have finished a unit doesn't mean the review should end. 7. Create a positive climate about school at home. Keep the focus on the good things happening in school. If there is something that you have a question about, email me first please. Help reinforce a growth mindset in your child. More information can be found on the Growth Mindset page. 8. Read something for yourself in front of your child. Studies show that students can be influenced to enjoy reading by seeing their parents read. 9. Consult this website frequently for many different resources, including IXL, ReadTheory, First In Math, and the Virginia Department of Education website. 10. Check your child's backpack every night for important papers.